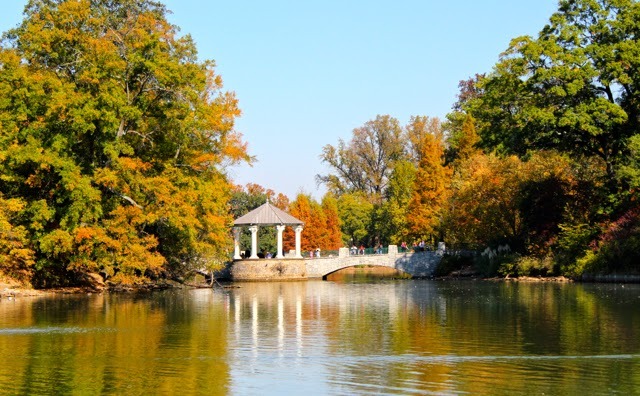 We're so lucky to live within walking distance of Piedmont Park, one of Atlanta's greatest city parks. That's why we are thrilled to be able to share the latest program from The Trust for Public Land, an organization whose mission it is to create and protect parks and other natural places, right in your own backyard. "The Trust for Public Land creates parks and protects land for people, ensuring healthy, livable communities for generations to come. We protect the places people care about and create close-to-home parks—particularly in and near cities, where 80% of Americans live." For Rocco and me, there's nothing quite like heading outside for an invigorating walk. It's good for the mind AND body. 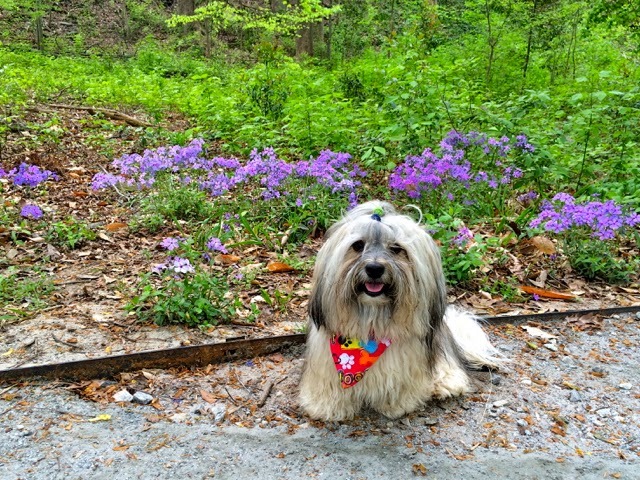 It gives Rocco a chance to get his "seek" on and for me it helps clear my head, enjoy time with my pup and get the benefit of some cardio activity, too! 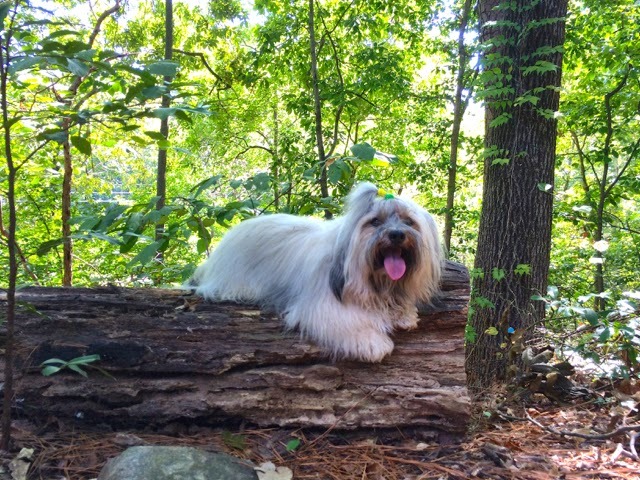 Rocco enjoys climbing on a log in a wooded section of the park. 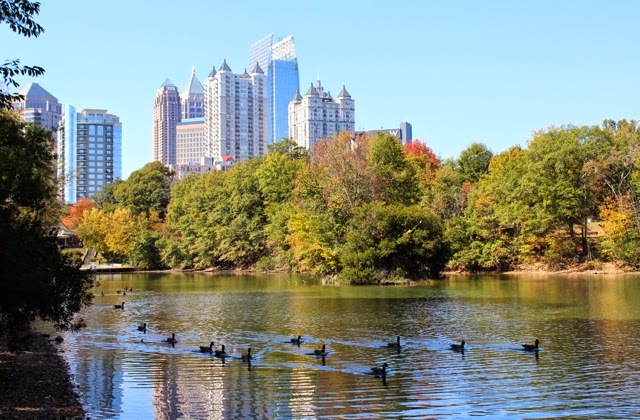 What's so terrific about walking in our local park, is not only is it close to home, but taking just one walk in Piedmont Park is like going to three or four different places all in one day! We have wooded dirt paths, bike paths, a duck pond, wetlands area and grassy fields all in one park. 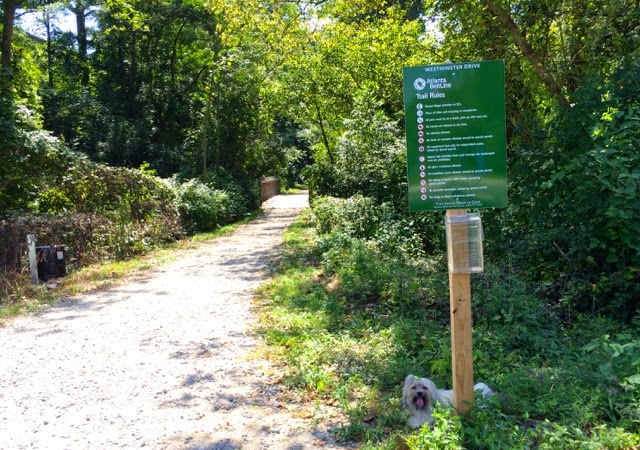 Can you find Rocco by the Beltline trail sign? In another section of the park, you'll find the start of one of the Atlanta Beltline trails, a fairly recent sustainable redevelopment project that will provide a network of public parks, multi-use trails and transit along a historic 22-mile railroad corridor circling downtown. The end result will include 33 miles of multi-use trails which will connect many intown neighborhoods directly to each other. We're lucky to have a portion of the Beltline so close to us, too. Rocco keeps an eye out for some of the regular duck visitors! 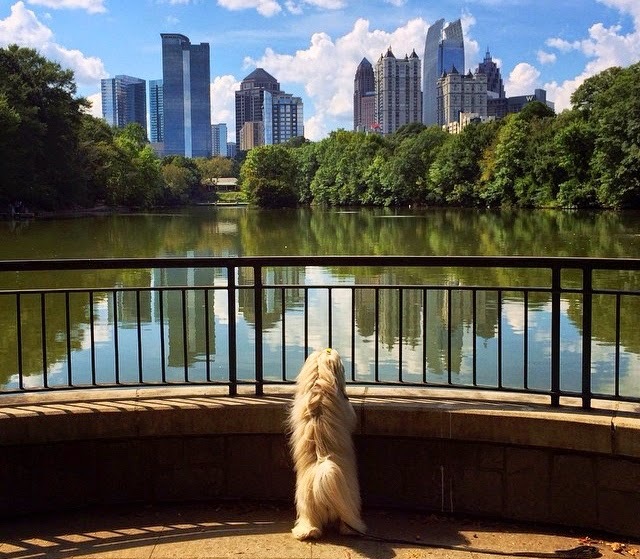 Heading to the other side of the park, we both love the view of the Midtown Atlanta skyline from Lake Clara Meer. Another view of the lake with a beautiful reflection... and a good place to reflect! It's just as pleasant a place to visit later in the winter. The ducks don't seem to mind! And always a good place to hang with friends. 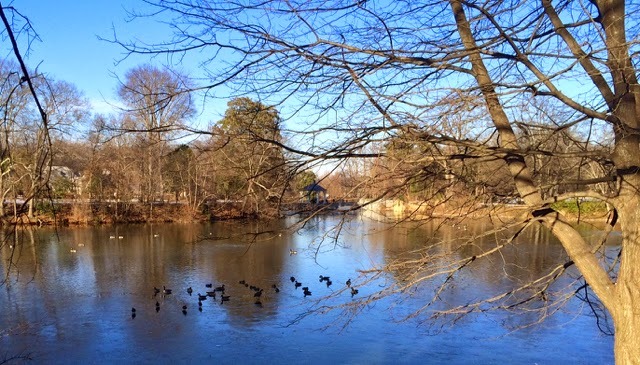 The ducks and geese enjoy this oasis in the city as much as we do! Did you know that in many cities, one in three residents lacks access to a park of natural area? And, with America's open spaces disappearing at a rate of 6,000 acres a day, we're at risk of losing those special outdoor places. 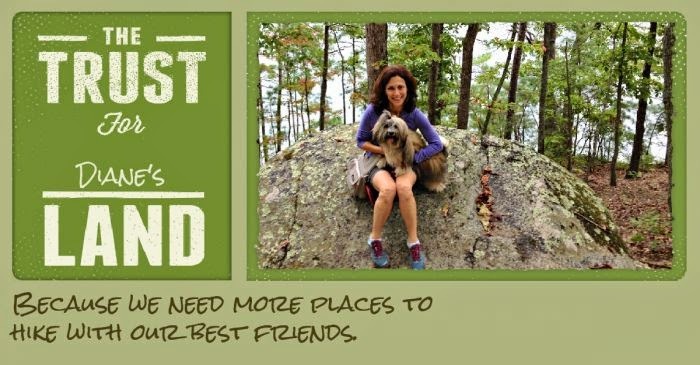 Here's how you can help The Trust for Public Land (TPL) protect the outdoor places we love, simply by sharing why they matter to you. 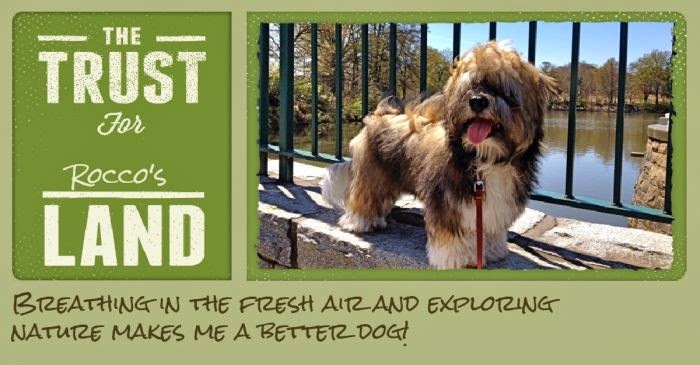 TPL is running a virtual postcard campaign on their website where you can create your own postcard with a photo that shows how you enjoy the great outdoors. Remember to share your creation with the #OurLand hashtag to help spread the word! Here are the postcards Rocco and I created! Tell us why nature matters to you in the comments below, and then don't forget to create your own fun postcard at the Trust for Public Land's #OurLand landing page! This post is sponsored by The Trust for Public Land and MomDot Media. This is a really fabulous initiative. Seattle, despite being less than a half a days drive from three of the nations most spectacular National Parks, is massively lacking in city park space per person. Thank you for sharing your beautiful city park and this great message. That surprises me about Seattle. I've never been there but hope to visit someday! One great thing about Minnesota is we have parks on our parks and trails over the entire state, so there are always fun places to go for walking adventures near the city or out in the burbs. That park there looks really nice and I love the skyline view. That's great that you have so many fun places to visit for outdoor adventures! We have lots of special events at our park too, like the disc dog competition we played in this year! Oh that is a beautiful place to walk, especially with your pals! We love to walk with our pals here! I guess in Michigan we are lucky because we have quite a bit of undeveloped public and private land. Most of it is paid for and maintained by hunter's monies from their license fees. Unfortunately there are forces working against allowing hunting and once the numbers of hunters and their fees fall off, I am not sure what will happen to these lands. But then there is Detroit, our closest large city. Due to blight, there are large areas that are just vacant land. I have even heard that people have spotted wild pheasants there. Wow! That's a surprise about the wild pheasants, though I know about the blight in Detroit. I lived in Ann Arbor for a while and there were so many beautiful areas to visit or ride bikes to. I love northern Michigan too, in the summer! Yay! We'll go check it out now! What a great photo of Gilligan! I love your postcard! Codie and Bingo are so adorable! 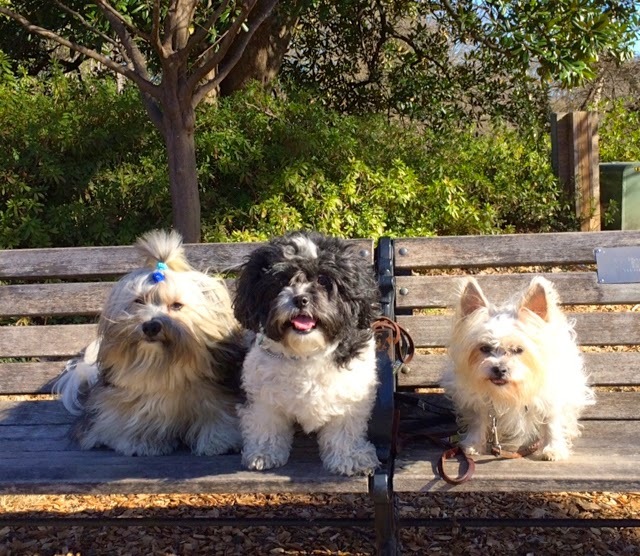 The three of these furkids have a lot of fun together! What a super place and great views and bonus is sharing it with friends. Have a fabulous Friday. Happy Friday Molly! We're lucky to have such a nice place to share with friends close to home. We're lucky to have four city parks within easy walking distance and a giant one a little further. Thanks for sharing such great beauty. Have a wonderful weekend.